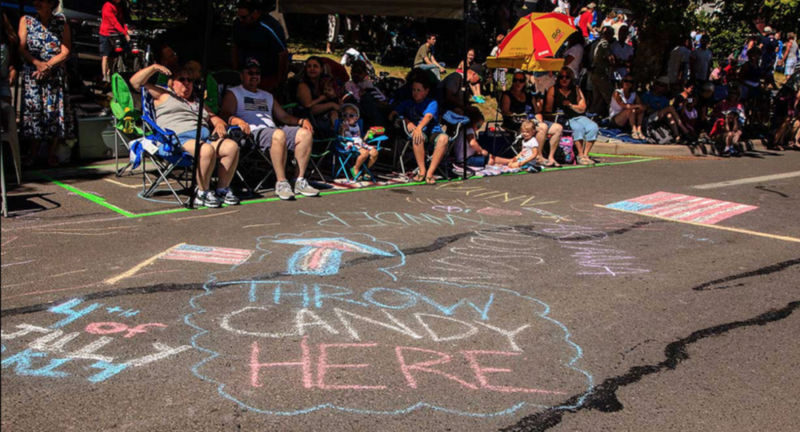 This was our first Fourth of July celebration here in Ashland, and it was a lot of fun. The only problem was that the baby fell asleep right after the parade and slept the entire afternoon so we never made it over to Lithia park to see the festivities. That will have to wait until next year I guess. Stay tuned for part 2. And the crazy thing is that it works. We got the memo, stopped by the day prior and marked off our spot between two trees, and the next day about 20 minutes before the parade we showed up and our spot was still open. Amazing. Of course, once you get settled, the people still looking for spots will tend to gravitate towards what looks like open space, but they won't really invade unless and until you are there to say it's ok. So we ended up sharing our space with a couple other groups, but we were happy to do it and it turned out fine. The whole thing felt very friendly and casual in a way I could never see happening in San Francisco or L.A.
And later in the evening, there was music. The John Dough Boys played at Home State BBQ which was fun for us because that's pretty close to the house. Thanks for a good time Ashland, and Happy 4th of July. Oh, and yes, my favorite was certainly Spatacus [sic].